We are the experts when it comes to developing a guard dog with a friendly nature and the strong capabilities needed when put to the test in security situations. Dog Security can train your guard dogs in Queensland at our Brisbane security training ground or our Gold Coast security dog development location. other locations are available so please enquire for more details. While larger dogs may appear more able to defend or protect, the truth is that without security training, a guard dog will not have the skills or understanding to deal with a security issue in the correct way. An untrained guard dog can have little power over an intruder, and if an untrained dog is aggressive in nature it can pose a threat to you and your family, or those who are on the property. Training by expert dog handlers will teach a dog how to be controlled and not aggressive, yet respond to potential threats where necessary. We train dogs for a variety of services, from Police patrol dogs, through to drug detection dogs or even at-home security dogs. The training process is very detailed to ensure each dog is ready to handle a variety of protection situations. Our dogs begin training when they are puppies so we can finely tune their skills and expose them to a number of different environments. 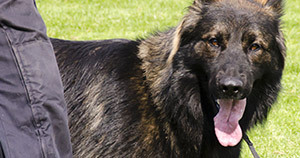 To learn more about our security dog training or to make an enquiry about a security dog, please contact us.